Despite turning green at lunch (the salad and quesadillas were delicious –- I just wanted to win an Ipad too! ), the day at the Gaithersburg Book Festival was just wonderful. I’m sure the balmy weather helped as it made being outside walking around, people watching, and talking to other book lovers idyllic. The Book Festival was bigger than I expected, but it was not too crowded. We could choose from nine different authors from an array of genres who spoke at different pavilions set up on the lawn of the county seat from 10 am to 4:40 pm. We attended the presentation from Jim Lehrer of PBS News Hour fame, who spoke about his experiences covering eight presidents for about 30 minutes. 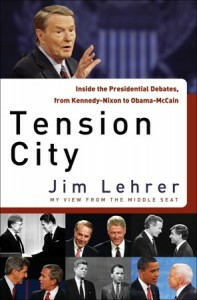 Afterwards, I was able to purchase my father-in-law “Jim’s” new book on presidential debates in a tent sponsored by Politics and Prose (small active independent book store in DC) and stood in line less than five minutes to have “Jim” sign it. I thought this was really cool and a well-thought out process for both the attendees and the authors. Everybody wins! And I have a gift for my impossible-to-buy-anything-for father-in-law, that I think he will actually appreciate and like as a PBS News Hour fan. Other presentations we attended usually included the authors reading from their last book. 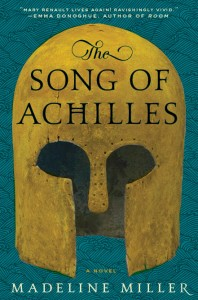 We listened to Tom McNeal (To Be Sung Underwater), David Linden (The Pleasure Compass) and Madeline Miller (The Song of Achilles), which we now plan to schedule for Bookclub. There were tons of kids activities, music at the “coffee house” (pavilion), and, of course, you could win free prizes(!) All in all a great day and I hope to go next year. I love book festivals. Unfortunately, I only seem to hear about them after they’ve happened. I must find a blog or website that will keep me updated. Do you know of one? Welcome Gabi! I don’t know of such a blog… but what a good idea! Somehow I usually hear about the book festivals in my area. Where do you live? Sounds like a wonderful time , hope to join you next year! Hi Bonnie, It was a very nice day! Maybe next year we can get a whole group of our members to come.